MANILA, Philippines — Former actress Michelle Madrigal has tied the knot with her American boyfriend Troy Woolfolk in an outdoor ceremony held in Austin, Texas, on Saturday. 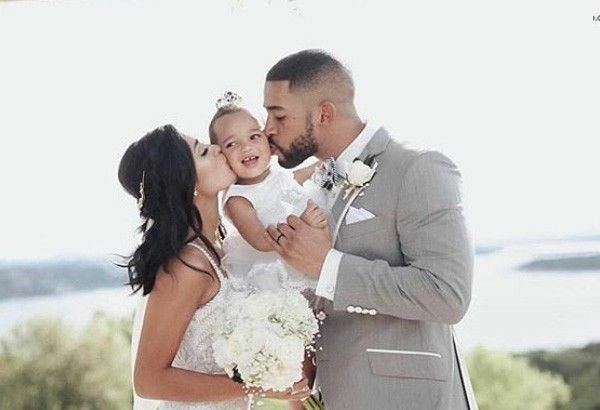 In her Instagram account, Michelle posted photos of her and Troy in the ceremony, including Michelle and Troy kissing their daughter Anika. “‘What GOD has joined together, let no one separate.’ Mark 10:6-9 — Thank you so much to everyone who made our day extra special,” Michelle wrote. The ceremony, which was held in Vintage Villas, was attended by her their families and close friends, including Michelle’s sister Ehra, mom Kaye and talent manager Pia Campos. In his Instagram account, Troy said he still feels on “cloud nine” after their wedding. “Still on cloud 9 after yesterday. Solidifying my relationship, meeting new friends and reuniting with old ones. I love my family and can’t wait to embark on this new journey as being not only a father but now officially a HUSBAND!” Troy said. Still on cloud 9 after yesterday. Solidifying my relationship, meeting new friends and reuniting with old ones. I love my family and can’t wait to embark on this new journey as being not only a father but now officially a HUSBAND!- - Thanks for @theartofeli for the dope fade !! Reports said that Michelle met Troy after she went to Texas to study Culinary Arts in 2016. She and Troy got engaged on July 2017, while she delivered Anika last October 2017.